This is easily one of the best goals this season. The St. Louis Blues haven’t had too much to cheer about this season. Sitting near the bottom of the NHL’s standings, the Blues faced long odds on the road against the red-hot Colorado Avalanche. With the score tied 2-2 in overtime, Blues defenseman Colton Parayko decided to give his team a needed two points with an incredible individual effort. Watch as Parayko goes end-to-end before using a one-handed backhand to win the game. That’s just bonkers. Let’s break this down so we can truly appreciate this goal. Parayko collects the puck in his own zone at the bottom of the far faceoff circle. He then turns on the jets, bursting past Avs forward Mikko Rantanen in the neutral zone. 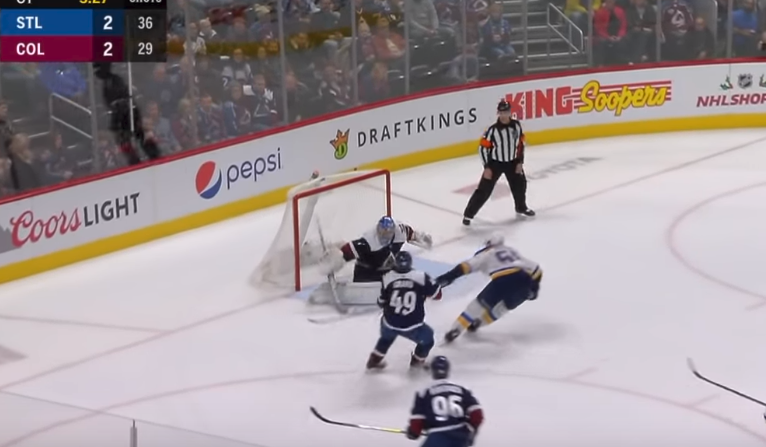 Then he completely undresses defenseman Samuel Girard with one hand on his stick, cutting in on goaltender Semyon Varlamov. There he finishes his insane effort with a one-handed backhander to end the game. It’s safe to say Girard wasn’t prepared for Parayko’s extremely long reach. This is the type of goal that you might expect from Sidney Crosby, a player who makes ridiculous backhand goals look easy. But let’s remember that the source of this highlight was a defenseman. That fact alone should place this straight into the Goal of the Year discussion, if not cement it as the winner.